Marcie from Married with Children tells us to "Know our Nuggets"
To promote their new popcorn chicken, their current ads ask the question, "What part of the chicken is 'nugget'"? 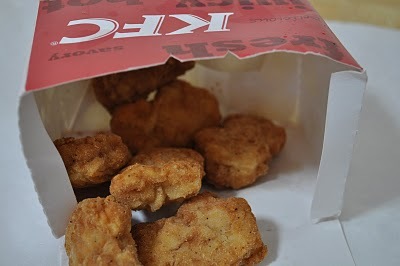 Hold up, KFC... you sold me nuggets for twelve years... AND TO THIS DAY YOU STILL DON'T KNOW WHAT YOU WERE SELLING? You didn't "know your nuggets"? How am I ever supposed to trust you hypocrites again? A la carte a reality?